When the show For Better or Worse had to cancel its run at the Fringe, Fringe veteran Jem Rolls, already touring his new show across Canada, came to the the rescue. Fringers know Rolls best from his high-energy poetry sessions, but with The Inventor of All Things he moves into new territory. The show is basically a lecture about the Jewish Hungarian physicist Leo Szilard (1898-1964), who was the first man to conceive of the notion of nuclear fission and the first to prevent the process from being used to create a bomb. Rolls views Szilard (pronounced “sillárd”) as a great Jewish hero because he was the man who prevented the Nazis from creating the atomic bomb. The show is an impassioned plea to rescue Szilard from obscurity and an attempt to explain why others he knew like Albert Einstein and J. Robert Oppenheimer came to overshadow him. Rolls, using his whole body to tell the tale and employing all the techniques of poetry, makes this a gripping story from start to finish. 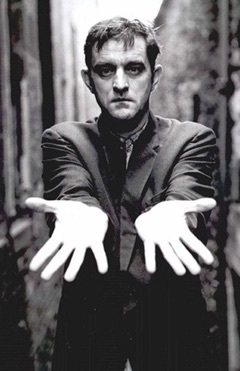 You hang on his every word drinking in the wealth of his surprising information set to the music of his language and the quirkiness of his humour. Never before has the biography of a scientist seemed so urgent and vital. In 1933 Szilard fled Nazi Germany and went to London. There while waiting at a red light to cross the street he had the idea of a nuclear chain reaction, a scene Rolls hilariously recreates. Szilard is the first known person to have had this idea since previous scientists, including Ernest Rutherford, the father of nuclear physics, had dismissed the notion of nuclear energy. Rolls conjures up the atmosphere of apprehension that Szilard felt when he learns that German scientists have discovered nuclear fission. Szilard and fellow scientist Enrico Fermi set up experiments to test whether the theory was true and patented the results in such a way that they would be kept secret to delay Nazi progress. Szilard later moved to New York and became part of the Manhattan Project to develop the atomic bomb. In 1942 he and Fermi created the first nuclear reactor and patented the device. that Szilard should be interned for the duration of the war as an enemy alien and many signers of the petition lost their jobs in weapons research. Szilard was one of the first to warn the US of an arms race with the Soviet Union and to campaign for arms control, but these were ideas with which the government was not sympathetic and which would not become public issues until much later. Rolls tells us his scheme for presenting Szilard’s life right at the start of the show. He will use stage left for narration of Szilard the scientist and stage right for anecdotes about the Szilard the man. These anecdotes often come in threes and are invariably humorous since Szilard was quite an eccentric. Rolls livens up his tale of Szilard the scientist by making his own suspense music by shouting “dut-dut-DAH!” before a major revelation. This technique caught on in the audience who started joining in with him. Rolls also generates humour by asking the audience questions to which we could not possibly know the answer and then answering the question with what sounds like a non sequitur. He thus makes us curious to learn what the bizarre response has to do with the question. Why, for example, would favourable US relations with the King of Belgium be so important for developing atomic power? Listen to Rolls and you’ll find out. Szilard’s self-appointed role as the gadfly to General Groves’ running of the Manhattan Project meant that his views and contributions were written out of triumphalist histories of the development of the bomb. This is a fascinating story passionately told. Rolls determination that Szilard’s role in history should bot be forgotten makes this show as entertaining as it is informative. 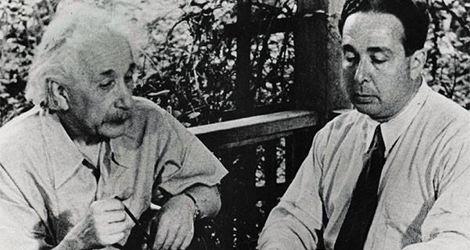 Photo: from top) Albert Einstein and Leo Szilard in 1946 recreating the signing of the Roosevelt letter; Jem Rolls. For tickets, visit http://fringetoronto.com or http://redsandcastletheatre.com.